S’mores-inspired treats are having a major* moment, you guys. And with good reason: They’re a playful nod to summer and the fun times toasting ‘mallows around the campfire, while ushering in the fall baking season. 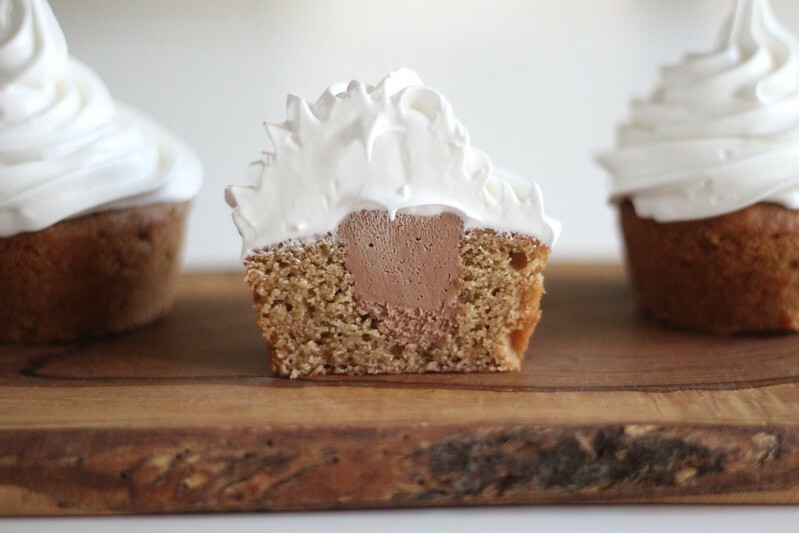 These s’mores cupcakes get in on this tasty trend, pairing personal-size graham cracker cakes with a whipped milk chocolate ganache core all topped with a generous plume of marshmallowy meringue frosting. All gluten-free. What’s not to love about that? Backing up a bit, I suppose I should share the origin story of these goodies. Last month, I was lucky enough to receive a box of gluten-free, back-to-school snacks from Pamela’s Products. Growing up, I was a HUGE fan of Teddy Grahams and Newtons, so these goodies were not only massively nostalgic, but also way too delicious for me to resist nibbling on straight from the package. In order to spare the Honey Grahams from the same, munching fate as the Mini Chocolate Grahams, I crushed them up in my blender and stashed the crumbs into my freezer for another day. My initial plan was to go with a classic Floridian dessert, Key lime pie, but that all changed when I saw a recipe for graham cracker cake on Food52. Immediately, I knew it was time to use the ol’ cupcake corer for more than just Faux Hostess; s’mores cupcakes had to happen. For the cake batter, I simply adapted my go-to gluten-free white cake recipe. The big changes were using the aforementioned graham cracker crumbs in place of most of the flour and starch, and scaling down the sugar accordingly. What results is a moist, tender-crumbed cupcake that tastes just like a graham cracker. Not wanting to overwhelm the cake’s flavor, I decided to go with a milk chocolate ganache filling in lieu of my usual choice, bittersweet. (Plus, what’s more classic than a Hershey’s bar for s’mores?) And to keep the textures more similar, whipped the ganache to make a fluffy filling that’s easy to pipe into the centers. To finish things off, a massive swirl of meringue frosting tops each cake. It might seem like an excessive amount, but trust that it’s juuuust right (and truly not too sweet). Made with only sugar, egg whites, a pinch of salt and a splash of vanilla, it’s not some heavy buttercream affair. While there are quite a few steps involved, I promise you that each one requires minimal ingredients, and is quite easy when taken in turn. You can take my word for it that the impressive, bakery-quality goodies that result will definitely be worth it and disappear before you know it! What’s your favorite spin on classic s’mores? Let’s talk in the comments or on Facebook! *Seriously. 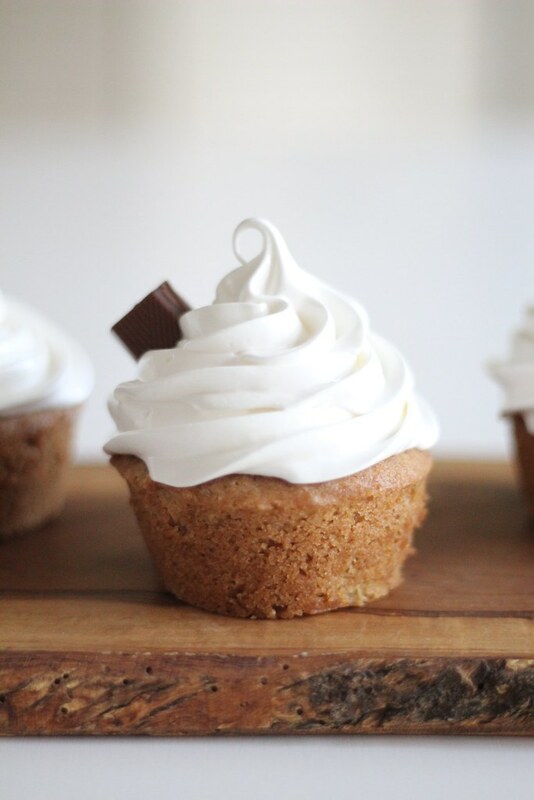 In the 24 hours after I shared these cupcakes on Instagram, I saw no fewer than three other s’mores-inspired treats posts on my various social media feeds — brownies and a gluten-free whoopie pie just to name two. Please, please, please DO NOT use cupcake liners for these, they don’t bake up the same! In a small saucepan, warm cream over medium-low heat, stirring occasionally, just until you see a bubble come to the surface. While cream is heating up, place chocolate through salt in a heatproof bowl. Pour hot cream over chocolate and let it sit for a minute; gently stir until the chocolate is melted and the mixture is smooth. Cover bowl loosely with plastic wrap, and set aside to cool to room temp (about 2 hours), stirring occasionally. In the meantime, make cupcakes. Preheat oven to 350°F. Grease 9 wells of a 12-cup muffin tin with butter (do not use cupcake liners, the cakes don’t bake up the same); set aside. Combine the sugar through Kosher salt in the bowl of a stand mixer, whisk to combine. Add butter, fit mixer with paddle attachment and turn to medium-low. Blend until mixture resembles wet sand (there won’t be any butter lumps like pie or tart crusts). Mix together egg whites through vanilla extract in a small, spouted bowl or measuring cup. With mixer running on medium, pour in liquid ingredients. Blend for about 30 seconds – 1 minute, or until mixture is smooth. Scoop about 1/4 cup of batter into each of the greased cups. Place tin in the preheated oven. Bake for 20 – 22 minutes, or until toothpick inserted in the center comes out clean and tops no longer appear wet. Remove from oven, and allow to cool for about 15 minutes before removing from pans (run a thin spatula around the edges to loosen). Allow cupcakes to cool completely before proceeding. Once cupcakes are cooled and ganache is at room temperature, the real fun begins! Using a cupcake corer, remove centers from the cupcakes and set aside for another use (aka samples for the baker!). Place cored cupcakes on a large platter or several plates. Pop the ganache into the freezer for about 5 minutes (we don’t want it to solidify, but the colder it is the easier and faster it is to whip up into a fluffy filling). Remove from freezer, then immediately whisk by hand until it thickens to medium to stiff peaks. Transfer whipped ganache to a piping bag fitted with a round tip (Wilton #12). Pipe filling into cupcake cores until level with the top of the cake. 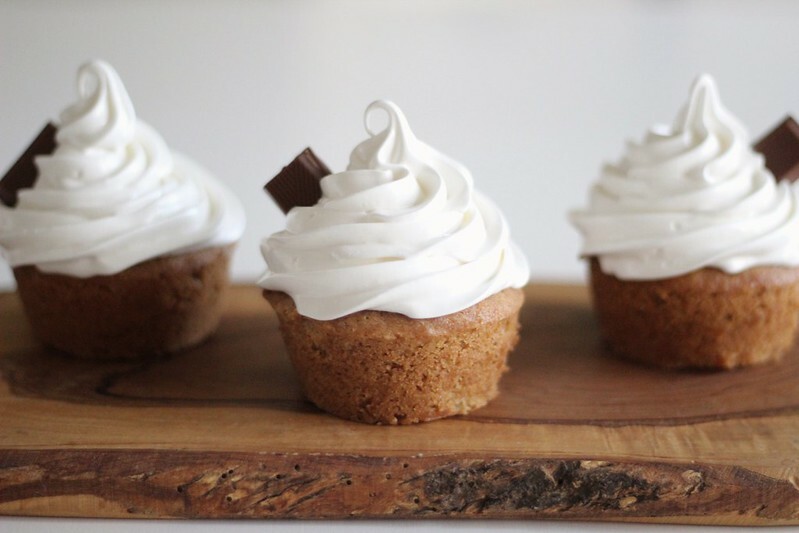 Transfer filled cupcakes to the fridge (up to a couple hours) while you make the frosting. Bring about 1″ of water to a simmer in a small saucepan set over medium heat. In a small, stainless steel bowl that fits on top of the saucepan without touching the water, whisk together egg whites, sugar and salt. Place bowl with eggs over simmering water; heat, whisking often, until they reach 120°F (only a couple minutes, no more than 5). Carefully remove bowl to several layers of kitchen towels, dry off exterior very well. Pour egg white mixture into the bowl of a stand mixer, fit with whisk attachment and beat on high speed until stiff, shiny peaks form (about 5 minutes). Fold in vanilla extract. Transfer meringue to a pastry bag fitted with a large open star tip (Wilton 1M). Holding the tip about 1/2″ above the center, pipe (working your way out then up in one continuous motion) a generous swirl of meringue atop each cupcake. Decorate with a small piece of milk chocolate, if desired, and serve immediately! Cupcakes can be stored in the fridge in a covered, airtight container for up to two days. For best texture, remove from fridge about 15 minutes before enjoying. Thank you so much, June! They certainly hit the spot — that tricky summer-fall transition one in particular 😀 Happy baking! !